A fortuitous art intersection has appeared in Burlington. Last Friday, Burlington City Arts celebrated the opening of new curator Heather Ferrell's first two shows; one of these is "Dave Kennedy: A Stranger Stands Here." 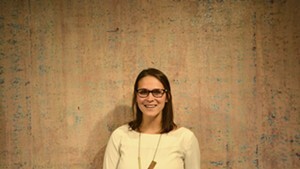 The Seattle-based artist is showing large-scale, wall-mounted collage and small-scale sculptural installations. Just a block away, in the basement of the Cavendish Gallery and Collective on College Street, Burlington-based photographer Monika Rivard has hung "Right/Wrong/Reason." 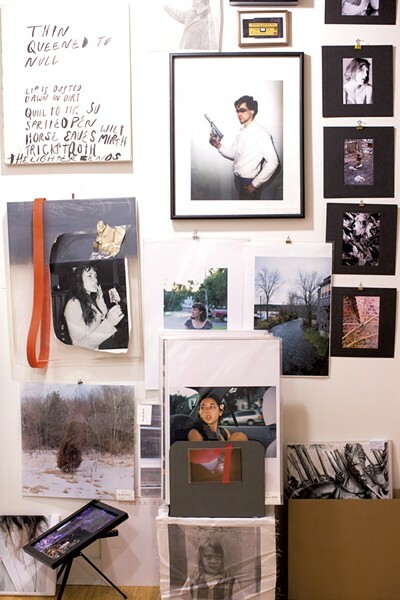 It's an engrossing, vulnerable installation that includes photographs in seemingly every format, from cyanotypes to gel medium transfers, as well as paintings, collage, assemblage, and tools and remnants of the artist's process. Kennedy, in his early fifties, is mid-career, and his exhibition is clean and choreographed — professional. Rivard, 29, is emerging. (Arguably, her exhibition is an important part of that emergence, a shedding of earlier skins.) But what the two shows share is a driving impulse to dissect, complicate and build on — figuratively and literally — the medium of photography as a means of negotiating identity. "Photography has a problem," Kennedy said in a recent interview for the blog of PBS series "Art21." "It's too precious and mechanical. The physical medium describes a sole, two-dimensional, framed experience." Kennedy's point of intervention (and contention) with the medium originates in his youth. He explained to the crowd assembled at the show's reception that he grew up in a neglected World War II housing project in Tacoma, Wash. His ethnically ambiguous appearance was met with racist reactions, as well as the all-too-familiar racist microaggression, "What are you?" The works at the BCA Center pointedly twist this question. On the walls are three composite scenes crafted from photocopied images of places that Kennedy finds reminiscent of his childhood environment — specifically, he said, places where he sought refuge. "Framed between two others" hangs in the middle of the trio. It's a disorienting amalgam of layered images of a nondescript blue building with a tarped-over opening. 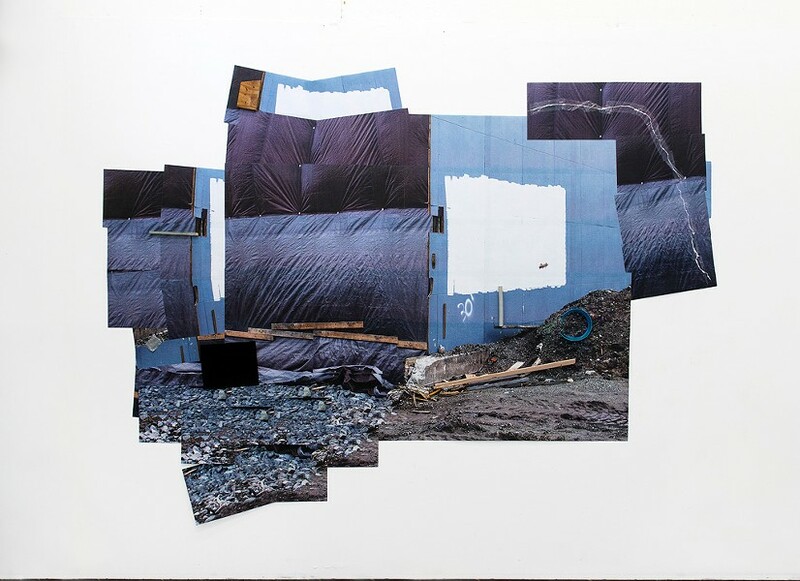 Several objects are affixed to the collage: a black rectangle, a busted ring of industrial plastic, and three pieces of scrap wood that might as well have come from the site in question. Upon much closer investigation, however, one finds some of the objects are not what they seem. Some pieces of wood are made, like the images to which they are affixed, from photocopies. This realization makes it difficult for the viewer to trust any of their first-glance assumptions. The black rectangle that looks uncannily like a mounted screen is actually a velvet jeweler's tray. The tumble of electric-orange fencing on the gallery floor is made of paper, not weather-resistant industrial plastic. What are you? How do you know? Kennedy locates his interrogations and illusions in spaces devoid of human presence for a reason. The offense of What are you?, after all, comes in part from the suggestion that you are less than human, not more than the sum of your parts or heritage. A what implies basic building materials, chemical breakdowns, a structure's bones — physical elements that, as Kennedy suggests, can be just as fragile and fluid as personal identity. "I believe that social constructs are stories that can be taken apart and told differently," Kennedy said on Friday. While Kennedy uses photographic manipulation and fragmentation as a means of studied, constructive undoing, Rivard's installation treats identity as something to amass and then intuitively rearrange. "A Stranger Stands Here" is relatively sparse and precise; "Right/Wrong/Reason" is intimate, filled with flesh and ephemera and traces of the artist's hand. Both take photography to task. Rivard has filled every wall in the basement space with images and artifacts of her creative life, dating as far back as age 11. A stack of well-used four-by-five film holders sits on a shelf beneath a framed inkjet-on-fabric print, saved from an undergrad installation at the California College of the Arts. Nearby, Rivard's diploma from that institution hangs behind glass. A Diane Arbus book sits on the floor. Across the room, a mixed-media work combines pictures of women with broken mirrors; the label says it took top prize when Rivard was in high school. Altogether, the show feels almost alarmingly confidential. Here, photography is not an isolated mechanical process; it's a lifeway. Rivard was raised in New Hampshire and Massachusetts by multiple photographers, she offered in a recent interview with Seven Days: "Photography has always been a member of my family, and the most important thing in my life." She echoed Kennedy's concerns about the medium, noting that "Once you know everything about the camera, the magic is gone." Rivard's work seems like an ongoing questioning of the medium to learn what else it has to offer, how it can be made to transcend itself. A photocopied portrait of a friend has been made sculptural with paint and a neon-orange bandsaw belt, which was pilfered (with permission) from the trash at Burlington's Riven studio. Paintings featuring Raymond Pettibon-esque script evidence the temptation of incorporating text. Fliers from past shows sit on the tray of an old enlarger. Slabs of concrete and images of plain building materials offer an obvious connection to Kennedy's work. Rivard said she hopes to continue to find ways to "feign ignorance" and reintroduce clumsiness to her work. Part of this growth means letting go of the past. "Right/Wrong/Reason" is a sort of personal de-accessioning for Rivard, who is in the midst of relinquishing an apartment and undergoing major lifestyle shifts. She has informally named the process "Release the Angels." A second component, "Public Hanging & Crucifixion of Sacred Symbols," consists of photocopies staple-gunned on telephone poles within eight blocks of her soon-to-be-vacated living quarters and in other local spots. It's especially apropos in the age of the iPhone to question the miracles and pitfalls of photography as it relates to defining one's home and oneself, and to viewing others. Happily, both Kennedy and Rivard move beyond familiar tropes, each working to give the medium new dimensions on their own terms. Correction, July 27, 2017: An earlier version of this story's headline misspelled Monika Rivard's name. The original print version of this article was headlined "Art Proof of Experience"